My early morning explorations of the outer solar system are continuing as the weather allows. Unfortunately, another series of Atlantic storms are sweeping across the UK so opportunities have been limited to one or two a week. That seems to be my turn around time for processing and then posting the images so I shouldn’t complain! After an early night, my alarm got me up were I was greeted by a beautiful sky. Overhead the stars and still-rising crescent moon lit up the frozen grass. Each blade was sparkling in the moon light making the garden feel like a star field. Once I was polar aligned and the camera was clicking away, the turbulent state of the atmosphere was revealed. Jupiter, for example, was like looking at the reflection of the moon in a mountain stream. I took a number of 2 minute videos of Jupiter, Mars and lastly Saturn hoping that one or two might be ok. 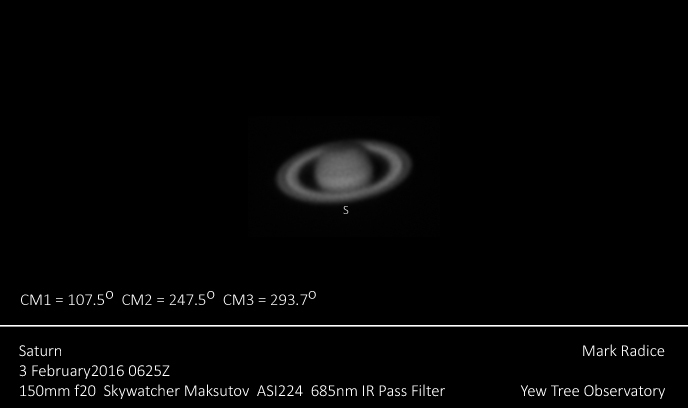 I didn’t even bother with the optical UV/IR cut filter and stuck to the 685nm pass IR pass filter were the seeing was slightly better. Luckily this proved to be the right approach as I managed to get at least one worthwhile picture of each planet. Jupiter, as always, is fascinating. I enjoyed watching Europa slowly disappear into Jupiter’s shadow. It winked out as it was cut off from sunlight by its parent planet. 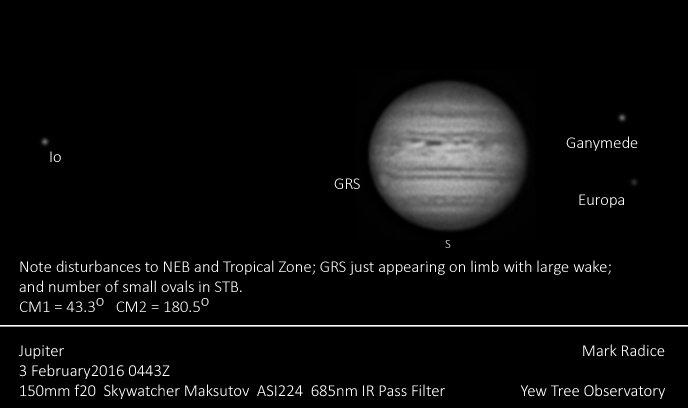 Meanwhile the Great Red Spot slowly rotated into view. There is a really long wake that cuts the SEB in two; while the NEB is very turbulent with a number of barges and festoons. Further south in the Temperate Zone, there are a series of white ovals imposed on the dark belt. Fascinating. Mars continues to grow. It is now just over 6″ in dia and the surface features are becoming more apparent. 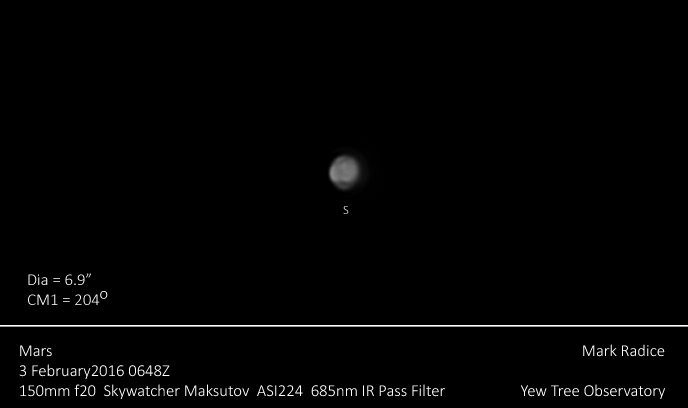 Unfortunately, shooting in the IR does not show the polar ice cap or the morning clouds. Even so, it is better than the blank featureless disc I get when imaging in the optical wavelengths. This is my first decent image of Saturn. Saturn, although spectacular to look at, is rather dull to the observer. It does not have the dynamism of Jupiter or the surface features of Mars. Even so, it is a pleasure to enjoy this glorious sight. Last but not least, the crescent moon was on the camera sensor. 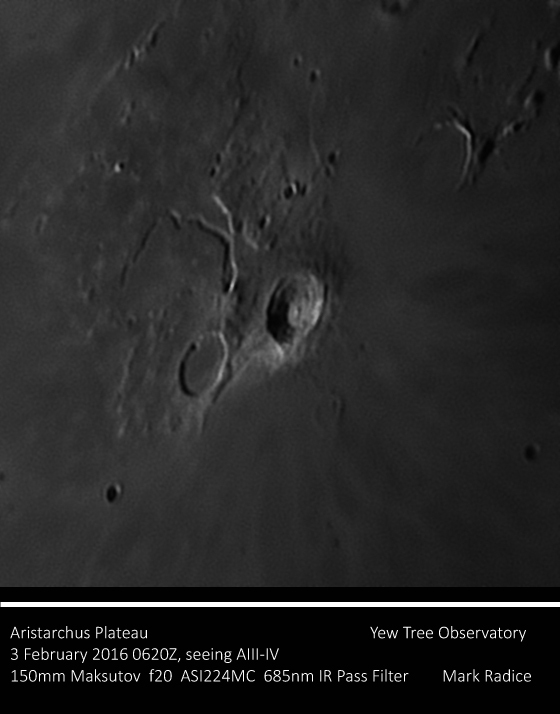 It too was boiling away in the poor seeing but I enjoyed catching Sinus Iridum at sunset and the fascinating Aristarchus plateau and its volcanic features. 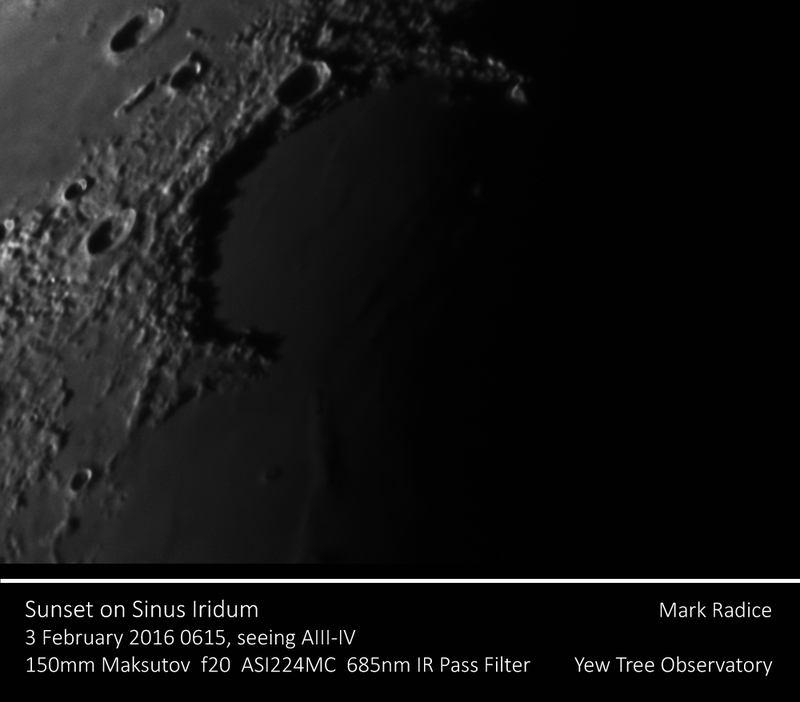 It just goes to show that the atmosphere is the real king-maker in high resolution lunar and planetary imaging. It does not matter how good the kit and the operator is. Without steady seeing, the camera simply will not work to its full resolution. As I was packing away before work, I marvelled that I had photographed 3 of Jupiter’s moons, the Earth’s moon and 3 planets in the outer solar system. It seems such a shame to waste such opportunities with sleep!